Capsaicin (pronounced "cap-SAY-a-sin") is the chemical in chili peppers that makes them spicy. Specifically, capsaicin occurs in the fruits of plants in the Capsicum family, including jalapeño peppers, cayenne peppers, and other chili peppers. Capsaicin in chili peppers is measured on the Scoville Scale and expressed in terms of Scoville Heat Units (SHU). The SHU is a method of describing how many drops of sugar water is required to dilute the heat of any given pepper. The units are measured in the thousands for more mild peppers and the range extends all the way to the hundreds of thousands and even millions for the hottest peppers. The sugar water method was subjective and not very reliable and has since been replaced by High-Performance Liquid Chromatography. This is a method that actually reads the chemical fingerprint of capsaicin in a pepper and is able to measure exactly how much capsaicin that pepper contains. Bell peppers are the only member of the capsicum family that don't contain capsaicin, and thus register zero Scoville units. Besides being the source of the heat, or pungency, in chili peppers, capsaicin will cause a burning sensation on any part of the skin or other tissues it contacts. Thus, when a cook is working with cut chili peppers, the capsaicin from their hands can burn their eyes if they rub them. 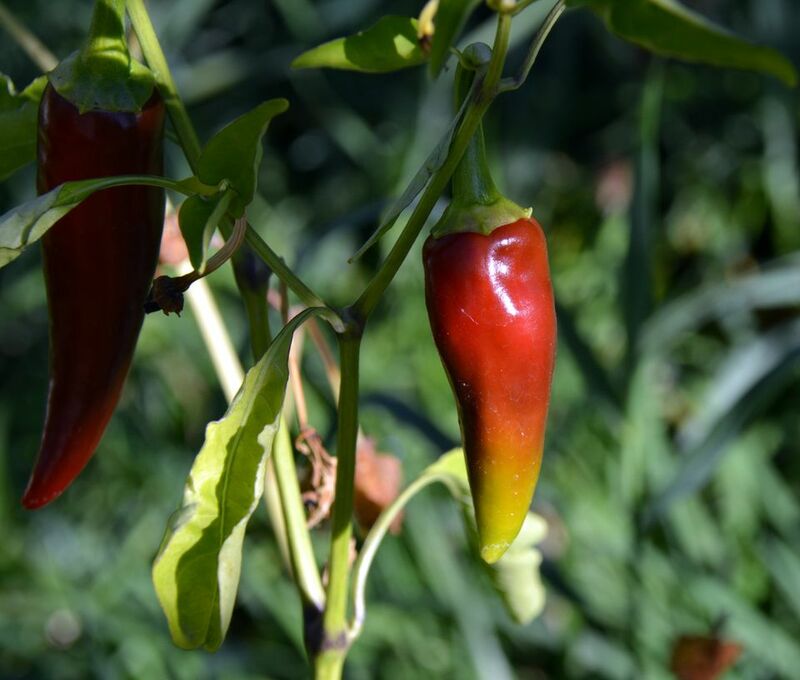 The white membranes inside a pepper contain the most capsaicin, and the actual flesh of the pepper contains less. The seeds of the pepper don't contain any capsaicin at all. When cooking with hot peppers, it can be helpful to wear plastic gloves to protect your hands and prevent touching other sensitive body parts. Also be sure to thoroughly wash all knives, cutting boards, or other cooking instruments that have come in contact with the hot pepper, as these can also transfer capsaicin to other foods or tools. Capsaicin is an oil-like compound in the sense that it repels water. Therefore, drinking water to soothe the burning caused by eating chilis isn't particularly effective, other than the cooling effect if the water happens to be cold. Capsaicin is soluble in milk and alcohol, however. So a sip of cold milk, or to a lesser extent, a cold alcoholic beverage, can soothe the burning feeling from capsaicin. Besides milk, other dairy products like yogurt or sour cream will help cool the burn from a hot pepper. Interestingly, while all mammals are sensitive to capsaicin, making it unappealing to rabbits and other such garden pests, birds are immune to its effects. If you grow hot peppers in your home garden, you may see birds eating your peppers, but other animals will likely avoid them. Capsaicin may also stimulate the production of endorphins, which is why some people report experiencing a sense of euphoria when eating spicy foods. Capsaicin has a number of non-culinary applications, including as a pain reliever and as the active ingredient in pepper spray. If you are interested in the health benefits of capsaicin, it's always best to speak with your doctor, as some hot peppers may also cause indigestion, heartburn, or other stomach issues. There Wouldn't Be Cocktails If It Weren't for Liquor, but What Is It?